Symbolic thought is what makes us human. 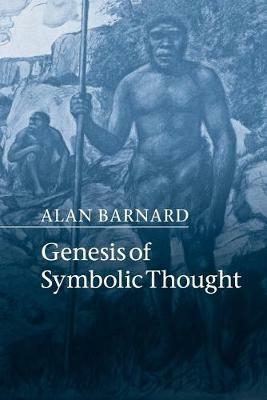 Claude Levi-Strauss stated that we can never know the genesis of symbolic thought, but in this powerful new study Alan Barnard argues that we can. Continuing the line of analysis initiated in Social Anthropology and Human Origins (Cambridge University Press, 2011), Genesis of Symbolic Thought applies ideas from social anthropology, old and new, to understand some of the areas also being explored in fields as diverse as archaeology, linguistics, genetics and neuroscience. Barnard aims to answer questions including: when and why did language come into being? What was the earliest religion? And what form did social organization take before humanity dispersed from the African continent? Rejecting the notion of hunter-gatherers as 'primitive', Barnard hails the great sophistication of the complex means of their linguistic and symbolic expression and places the possible origin of symbolic thought at as early as 130,000 years ago.